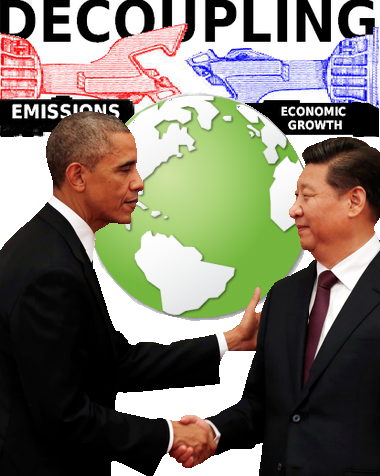 On Saturday September 3 the world's two largest polluters, the US and China, formally ratified the Paris Climate Agreement. While this is no surprise it does contribute to the momentum of the process and it adds to the pressure on other nations who have not yet ratified the deal. The signing of the agreement by the world's economic superpowers is far more than just a photo op. Together China and the US are responsible for 40 percent of the world's emissions and the ratification is but the latest example of climate cooperation between the two nations. China has promised to stop the upward path of its emissions by 2030. China is already reducing its use of coal and the Paris deal will mean that the nation will have to move away from coal at an even faster rate if it is to achieve the emissions targets it has agreed to. This will in turn have a ripple effect in the dirty energy sector driving another nail into the coal industry's coffin. The death of coal can't come soon enough for those who hope to keep the world from warming more than the upper threshold limit of 1.5 Celsius above preindustrial norms agreed upon in Paris. Urgent action is required as we are already 1.3 of our way towards the upper limit. The US is has committed to emissions reductions of 26-28 percent below its 2005 level by 2025. This will bolster support for the Clean Power Plan and other Obama administration emissions reduction efforts. It is also a victory in another respect. It sets a precedent and shows that even nations with serious disagreements can still come together to work on climate issues. If these two nations can continue to cooperate on climate issues that will take us a long way towards addressing the climate crisis. As reported by the BBC, just ahead of the G20 summit that started on Sunday September 4 in the city of Hangzhou, China, Mr Obama said: "History will judge today's effort as pivotal." The timing of the ratification was no accident as the signing took place just ahead of a G20 meeting. This will put ratification pressure on other nations present for the talks. It will also add to growing calls to abandon fossil fuel subsidies. As explained by President Obama in a speech delivered in Hangzhou, the agreement is the "single best chance that have to deal with a problem that could end up transforming this planet". UN Secretary General Ban Ki-moon praised Mr Obama for what he called "inspiring" leadership and he said that Mr Obama and China's President Xi Jinping had both been "far-sighted, bold and ambitious". There are now 25 nations that have formally ratified the deal with more expected to follow in the coming weeks and months. To take legal force, by the end of the year, the deal must be ratified by at least 55 countries representing 55 percent of global carbon emissions. It seems very likely that these preconditions will be met. However, if Republicans win in the November general election it would be a catastrophe for the Paris Accord and climate action. Republicans are still professing allegiance to fossil fuels even in the face of flooding in Louisiana and July's breaking heat. For the rest of the world that subscribes to science, decades of heat records set year after year and month after month call attention to the urgent need for action. It should be noted that current INDC pledges will need to be strengthened if we are to stay within the upper threshold limits. Even if all the nations of the world meet their promised emissions reduction pledges we are still on track for at least 2.7C of warming. Despite the daunting challenges we face there is reason for optimism. We are seeing evidence of decoupling of revenue growth and emissions. According to Sustainable Brands, this trend is discernible in data from the world's largest companies known as the Global 500. The Global 500 Greenhouse Gas Performance 2010-2015: 2016 Report on Trends, indicates that these companies represent 28 percent of the world’s Global Domestic Product (GDP) and 10 percent of the world’s GHG emissions over the last five years. Revenues for the companies grew roughly 5 percent, while their emissions only increased by 1 percent over the most recent four-year period. Unsurprisingly, many of the biggest emitters are fossil fuel companies, and some of these companies has emissions increases rather than decreases. "We did find promising the trend on lower emissions growth versus revenue growth for the Global 500 as a whole, however many of the largest emitters have yet to show this kind of decoupling."